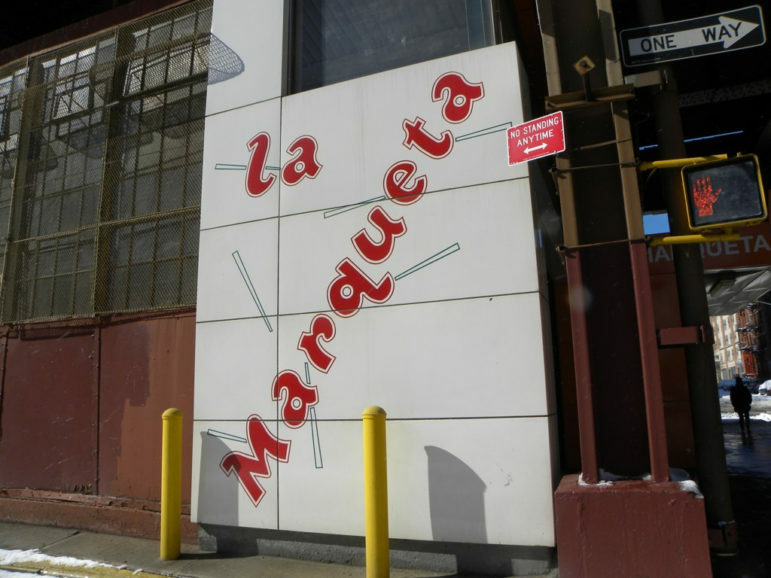 The city's promise of tens of millions in investment helped cement support for the East Harlem rezoning, But some critics have questioned exactly how that money will be spent, including whether it should support entities like La Marqueta versus more affordable housing. Last Wednesday, city planners returned to the East Harlem community board to give their first update since the City Council’s passage of the East Harlem rezoning last November. The mood in the room at the Land Use Committee meeting may have been less jittery than last spring, when, in halls flooded with protestors, the full board was racing against the clock to make a decision about whether to support the De Blasio administration’s proposed rezoning plan. At the least, there were some jokes this time around: “Y’all have my e-mail, my number, I’m not giving you my home address,” said Calvin Brown of the Department of City Planning (DCP). Yet strong disagreements and concerns remain about the plan that ultimately passed, which was a modified version of the city’s proposal accompanied by what City Hall calculates to be $178 million in neighborhood investment. The neighborhood rezoning—the de Blasio administration’s third to be approved—increased the allowable residential and commercial development on several neighborhood corridors, with a portion of that development required to be income-targeted under the city’s mandatory inclusionary housing policy. Throughout the planning process prior to the rezoning’s approval, the community was deeply divided. Some, including the community board and Borough President Gale Brewer, pushed to make the city’s plan more like the East Harlem Neighborhood Plan, a proposal for a more modest rezoning and comprehensive set of neighborhood initiatives crafted by a steering committee of stakeholders appointed by local councilmember Speaker Melissa Mark-Viverito. Ultimately, those advocates gave City Limits differing impressions of the final plan negotiated by Mark-Viverito and the City Council: some felt the Council had done fairly well, while others felt the Council had failed to attain many of their asks. Then there were the advocates who always believed any rezoning would cause gentrification and displacement and who remain adamantly opposed. What these advocates are doing now also varies: Some opponents are suing the city with the help of the Legal Aid Society, which had already launched a court case with Crown Heights residents to stop the Bedford Union Armory redevelopment. Others are focused on continued advocacy to make the plan better, or on holding the city accountable to its promises. At the committee meeting, DCP’s Brown and staff from the Department of Housing Preservation and Development (HPD) provided an overview of the final deal reached between the Council and the de Blasio administration. The Council was able to scale back the allowable density proposed by the city and lower height limits on future development, though still allowing more density on Third Avenue than originally included in the East Harlem Neighborhood Plan. DCP has also committed to a few follow-up tasks, such as reviewing parking requirements in the neighborhood and introducing amendments to restrict building heights in certain areas that were left without a height limit. The Council also secured a variety of neighborhood investments, from $50 million for repairs at NYCHA developments in the area, to investments in a waterfront esplanade, to the creation of a new Workforce1 center in East Harlem. HPD also updated its housing plan for East Harlem with several new initiatives, each with its own implementation timeline. For instance, East Harlem will be one of the focus areas for the pilot “certificate of no harassment” pilot, which will require landlords seeking to renovate or develop their properties to prove they have not harassed tenants. That program is set to launch in September 2018. East Harlem is also one of the areas targeted for the city’s new Landlord Ambassador pilot, which funds community organization to reach out to small landlords and provide them with information about HPD’s affordability programs. The Mutual Housing Association of New York (MHANY) began providing these services late last year and will continue through the end of FY 2019, and has begun by targeting property owners who have outstanding tax liens in the neighborhood. The city has also newly committed to developing more publicly owned parcels of land with affordable housing. And when selecting developers for projects citywide, HPD now has a preference for developers who have demonstrated a track record of investing in community and economic development and to those who make meaningful community engagement part of their development plan. The agency also now gives equal weight to developers who have significant housing rehabilitation experience. Those changes would appear to give a leg up to nonprofit and locally based developers, who have complained of being shut out of the mayor’s housing initiatives. Brown emphasized the city’s commitment to transparency going forward, noting that a list of the city’s commitments to East Harlem had been posted within 30 days of the rezoning’s approval. He handed out a list of those commitments in a spreadsheet referred to as a “commitments tracker,” with columns indicating timeline and funding, that will be updated annually. The city will also issue an annual progress report, as was done for East New York, the first de Blasio rezoning, last June. In the coming months, other city agencies will visit Community Board 11 to present updates on their investments in the neighborhood, Brown said. Last June, Community Board 11 voted against the East Harlem rezoning but said they would be able to accept a more modest rezoning under certain conditions, including that 20 percent of new residential units are made available to households making less than $25,770 for a family of three and 30 percent are for families making between $25,770 and $103,080. Many others said the board should have simply rejected a rezoning altogether. At the recent committee meeting, board members still expressed concerns that the rezoning and accompanying HPD investments would not create enough housing affordable to residents making lower incomes, including people making less than $10,000 a year. “We really need to help these individuals because they’re the ones who are living in the shelters,” said Land Use Committee Chair Candy Vives-Vasquez. The concern was echoed by Board Chair Nilsa Orama, who, in her work helping residents apply for affordable housing often engages with NYCHA residents who seek to leave their deteriorating apartments. “When they apply, they don’t make enough because they’re on disability or retirement,” she said, adding that while she understood developing housing for middle-income people is important too, the city needed to make it more attractive to developers to build apartments for the lowest income bands, as well as invest more in NYCHA. “This is not a victory; this is a beginning,” she said. According to HPD, over the past four years, 15 percent of the units built or preserved in East Harlem have targeted households making below $25,770 for a family of three. Some upcoming projects on public land will have more units for such families. A board member objected to the fact that there was, in fact, no information provided about funding for the majority of the initiatives in the tracker (these initiatives were labelled with a mysterious “N/A”), while another expressed concerns that the city was counting citywide initiatives that would have happened with or without a rezoning. “We should be getting something out of it beyond the fact that it’s already a citywide initiative,” said Marie Winfield. Questions were also raised about how the city would ensure local residents were prioritized for new income-targeted units if the city lost the fair housing lawsuit over its community preference policy, and about whether the city was investing sufficiently in construction safety training for local residents. Orama, who ran against prior board chair Diane Collier last year and assumed the position this January, says that the board may begin a discussion about the best use for public sites in the neighborhood so that it can be prepared with its own demands if the city starts its own visioning process for those sites. In addition, Orama intends to improving the board’s community engagement through strategies such as translating the board’s documents into Spanish, holding meetings in a variety of places, and attending activities to inform residents about the board. This addresses a concern often heard during the rezoning planning process: that not enough community members knew about the rezoning or the board’s role in the approval process. And even though the rezoning is now passed, that doesn’t mean the board’s role shaping land use patterns is over. Wednesday’s land use committee meeting also included a lively discussion about whether or not to support a local property owner’s bid to build a two-story auto-repair shop on land zoned for industrial uses and that the board has long wished to rezone for residential uses. It quickly became a debate about how to meet competing priorities like job creation, on the one hand, and quality of life, on the other. Community Voices Heard, a member-led community organization that fights for low-income residents and people of color and was a key participant in the East Harlem Neighborhood Planning process, has not made public statements about the rezoning since its passage. “We haven’t come out [with] ‘this is the worst thing in the world’ and we haven’t come out dancing in the street, because there’s a lot of wait and see. … We’re focused on enforcement to ensure, while we would have wanted a lot more, that what is there is actually enforced,” says Community Voices Heard’s executive director Afua Atta-Mensah. Member Agnes Rivera says that not enough of the East Harlem Neighborhood Plan’s demands were taken into account. “Why make it seem that you’re really interested in our point of view, in our plan…and then not even take in into consideration, not even implement a quarter of it?” says Rivera. Their main concern is that the rezoning passed will fail to create housing affordable to those who currently live in the neighborhood, who are already feeling the effects of rising rents and watching their local grocery stores close or become unaffordable. “That’s what’s really frustrating—we can’t even support our neighborhood anymore,” says member Rose Fernandez. They’re also concerned about the potential of the rezoning to exacerbate the market pressures on tenants living in existing rent stabilized housing. The East Harlem Neighborhood Plan asked for 20 percent of total units created on public sites to be affordable to families making below $25, 770, and the city has offered as much on some of the upcoming developments on public sites. But Community Voices Heard itself has long pushed for a larger target of 40 percent. Community Voices Heard also objected to the rezoning’s lack of provisions for creating union jobs on construction sites, and to what they see as lack of protections for small businesses, insufficient public education by the city about the meaning of the rezoning, and an insufficient contribution to NYCHA. David Nocenti, executive director of the social services nonprofit Union Street Settlement and another participant in the East Harlem Neighborhood Planning process took a slightly more positive tone about the investment package passed with the rezoning. “I think most people would be happy with the level of commitments that were made, but again the key [question] is going to be: … three years from now, will they have actually occurred?” he said. Chris Cirillo, executive director of Ascendant Neighborhood Development Corporation (formerly Lott CDC), a non-profit developer, was similarly cautious but optimistic. Yet he said that he is still concerned about a lack of adequate investment in NYCHA, and had many questions about the development of public land in the neighborhood, like to what extent the city would subsidize development there and who would do the developing. He said the city seems to be interested in working more with nonprofit developers, a move he called “heartening” and that he hoped would continue. Cirillo said his organization is also looking forward to participating in Partners in Preservation, a new HPD-funded initiative that will bring together community organizations throughout the neighborhood to collaborate on anti-displacement strategies. And his group was also chosen to develop four small public lots in East Harlem with affordable housing. Marina Ortiz, an advocate with East Harlem Preservation and a board member of the East Harlem-El Barrio Community Land Trust, who has always opposed any rezoning, asked Brown on Wednesday why the city was investing $25 million in renovating East Harlem’s public market, La Marqueta, when such money could go to subsidizing for deeper affordability or to the community land trust. (So far, the community land trust has received $500,000 from Mark-Viverito and $500,000 from Enterprise Community Partners). “The investments that are being made in East Harlem are [city planners] ‘looking toward the future,’—and that future will not include us,” Ortiz explains to City Limits. She also takes issue with the building heights proposed for the intersection of 116th Street and Lexington Avenue—up to 20 stories—which she says will result in the demolition of the commercial heart of East Harlem. Without a doubt, East Harlem is seen as ripe location for real-estate investment. This early on, however, it’s difficult to measure exactly how much the rezoning has or will exacerbate existing market trends. Last week Yair Tavivian, who heads the real-Estate company Douglass Elliman, told Multihousing News that East Harlem and Midtown East are an attractive place for condo investment because the prices, at below $3 million, are still “attainable,” because the new Second Avenue subway line is attracting residents, and because of the recent rezoning. “We’re seeing lots of developers snapping up sites there, along with the telltale coffee shops and upscale grocery store openings, which are always indicative of an up-and-coming neighborhood,” he said. On the other hand, Holley Drakeford of Drakeford Realty Group, speaking to BisNow about the future of the east side of 125th Street, said that people are still figuring out the East Harlem rezoning. She predicted that things would only begin to get hot on East 125th Street if two major planned development projects got underway: the development by the Durst Organization of a large and long vacant lot on East 125th Street and Park, and Extell’s planned project between Lexington, Third Avenue, 124th Street and East 125th Street. According to median rent listings of multifamily apartments collected by Zillow, median rents in the southern part of East Harlem grew significantly in the winter of 2016 and then fell back to 2015 levels by January of this year, while rents in the northern part of East Harlem varied over time, though ultimately increasing from January 2015 ($2150) to January 2018 ($2275). Another Zillow calculation, the Zillow Rent Index, which looks at homes both on and off the market, indicates a starker trend, with median rents increasing from about $2347 in the north and $2611 in the south to roughly $3000 in both parts. Ortiz says that recently, small businesses have begun closing on 3rd Avenue. She suspects this to be a sign that speculation is on the rise as a result of the rezoning. Cirillo says so far, he sees the change manifest in how brokers market the area. “Nobody‘s wasted time in mentioning that there’s new zoning,” he says. As for development generated by the rezoning itself, “I think now that the rezoning is in place we will see that in the coming months,” he says. What HPD did succeed at was taking away many fabulous community gardens. This is a very good and balanced article. I appreciate the information. The board’s vote is not binding, but it sends a signal to higher powers that the rezoning proposal will need to change before it has local support. Many of the defining policy storylines of today’s New York are, in one or more ways, on the plate of the Fifth Avenue Committee’s executive director, who is also on the City Planning Commission.